Usually when you want to catch big fish the idea is to avoid the crowds. Admittedly, the following places are probably not going to net you the biggest whoppers in North America, but they will bring you some great pictures to share with friends and probably some pretty nice trout as well. Here are some of the five most iconic fishing spots in the west. 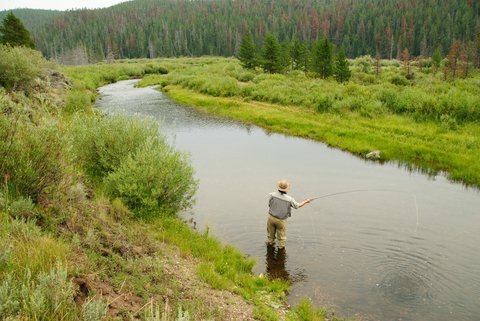 Heralded as one of the best trout fishing streams in North America, Henry’s Fork of the Snake River is located in the eastern edge of the Idaho panhandle near Yellowstone National Park. Fly fishing enthusiasts have long trumpeted this section of the Snake as one of the most lucrative spots for healthy trout. Henry’s Fork includes upper and lower Mesa Falls and travels through Harriman State Park before reaching the Snake River. Grizzly bears are starting to return to the area meaning the fishing has probably picked up also, but that’s even more reason to be bear safe at all times. If there ever was an iconic spot to fish in America it’s the Gallatin River in southwest Montana. Flowing from Yellowstone National Park to the Missouri River, the famed canyon section that extends about 25 miles through a narrow gorge was the setting for the fishing scenes from the movie A River Runs Through It. Lots of river guides out of Bozeman, Montana can help you navigate this American treasure that still offers great fishing and certainly some of the most scenic. Here’s another for the fishing bucket list and it’s the North Umpqua River in Southern Oregon. This gorgeous stretch of river includes some great fishing and whitewater rafting, offering some of the best of the Pacific Northwest. Known for its salmon and steelhead runs, there is never a bad time to be on the Umpqua. The river boasts steelhead fishing until May then the shad pick up and by June and July people flock to the river for small mouth bass and summer steelhead, and by September and October the fall chinook arrive. In northeastern Utah there’s a section of the Green River that’s notorious with trout anglers where avoiding the crowds means fishing in the spring. This stretch of river that’s most attractive to the fly-fishing kind lies below Flaming Gorge Dam. Named by a civil war veteran who floated the river in 1869, it’s below the gorge where drift boats can be lined up at the boat ramp during the summer. Put in here for a float through steep-walled canyons where wild brown trout offer world-class fishing. In Wyoming’s Wind River, anglers can either hike into the high country or float down another one of America’s spectacular canyons. For clear mountain lakes the Wind River Range is home to a thriving trout population of the rare golden variety. Here you can also choose to float down the main section of the Wind River where there is great trout fishing and whitewater rafting river through the awe-inspiring Wind River Canyon.